Hunter's Irrigation Management & Monitoring Software (IMMS) is a PC-based software package that makes central control of large-scale irrigation systems affordable, usable, and comprehensible. IMMS software and hardware have been intensively developed and refined into a graphically based irrigation command and control program. 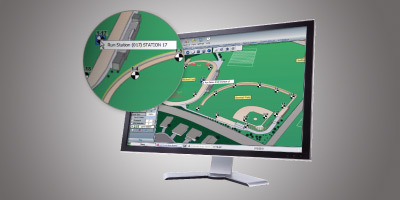 IMMS interactive map graphics (to station level) put the irrigation system manager in complete visual control of wide-area watering operations and now include the ability to import CAD designs. An optional plug-in ET software module provides complete weather-based irrigation with station level soil moisture modeling, using inexpensive local ET sensors. IMMS has a full range of communications options, including Ethernet, GPRS mobile, dial-up telephone, UHF radio, and hardwired cable. IMMS is compatible with Windows operating systems through Windows 8. Clik Sensors: Each controller should have its own rain sensor for fast rain shutdowns. All Hunter Clik sensors are compatible with ACC and other Hunter controllers. ET Sensor: ET Sensor platform is for use with IMMS-ET software. ET Sensor is added to selected ACC controllers, to report local conditions. This local ET data has no additional monthly charges and can be shared through the software to create schedules for other controllers in the same micro-climate (including ICC or Pro-C controllers). Add as many ET Sensors as needed to sample all micro-climates.